SAY IT AIN’T so music fans. Say it ain’t so. Slane Castle will not be hosting a concert this summer. We repeat, there will be NO gig at Slane in 2014. That’s the official line coming from the main man himself anyway. Lord Henry Mountcharles made the announcement earlier this afternoon and the news spread quickly through the Castle’s Facebook and Twitter account. “I never do a show in Slane unless I have an act that I feel is right for the venue. There wasn’t anything available this year that grabbed my imagination”, he told FM 104. That doesn’t mean that I’m not looking very actively at 2015. I have done this before, the act’s got to be right for the show to be right. The internet was absolutely devastated to learn that there would be no musical pilgrimage to the Royal County, and immediately came up with it’s own theories about why the show would NOT go on. Meanwhile others were too busy lamenting their musical loss to worry about country music stars. While others could see a light at the end of the tunnel. Well now, tell us, are you delighted or disappointed? Email “There won't be a concert at Slane this year and Twitter blames Garth Brooks”. 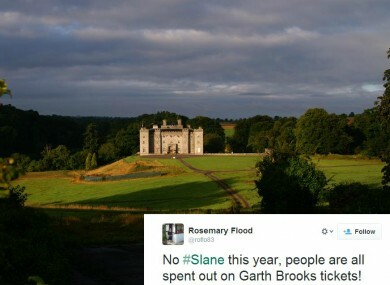 Feedback on “There won't be a concert at Slane this year and Twitter blames Garth Brooks”.